Ada and Darcy: Pink Hallway Love! Woow I lake it this furniture! Nice and romantic look. Kisses and hugs dear Kellie. How pretty is that pink! That's gorgeous Kellie! 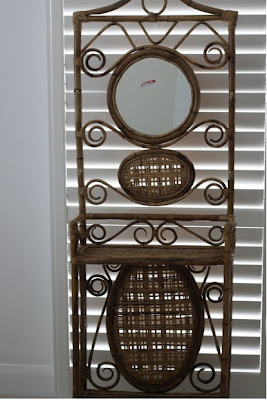 I have a few cane pieces I'm trying to decide what to do with and you've re-inspired me about it after seeing your makeover! I love, love, *LOVE* the pink! Love all the eyecatching color. I've never been on your blog before, but I think you have a new follower (c; Gorgeous! This is just adorable. I love the pink, its so feminine. 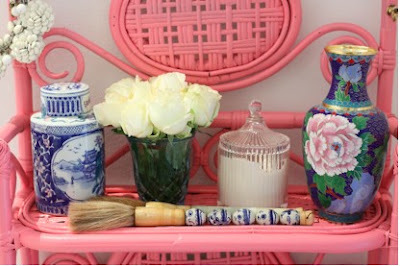 I wish I had a pink spot in my house all for me! It's fabulous! Liked it brown - love it pink. so pretty! It's spring... thank you! 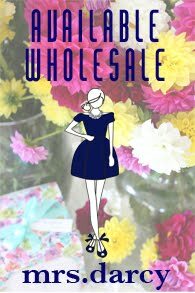 Kellie - this is fabulous. You always take such great photo's as well, do you have snazzy camera or is it pure talent? I'm inspired now, off to my local 2nd hand store to see what I can paint! ooo it is just magical! This little nook is so nice! ANYTHING AND EVERYTHING is better pink! Looks GREAT! Looks fabulous drenched in pink!!! I love pink! it looks fantastic Kellie! I have to get in gear and do my painting projects - I keep putting it off! Much better in the pink! Paint makes such a difference! 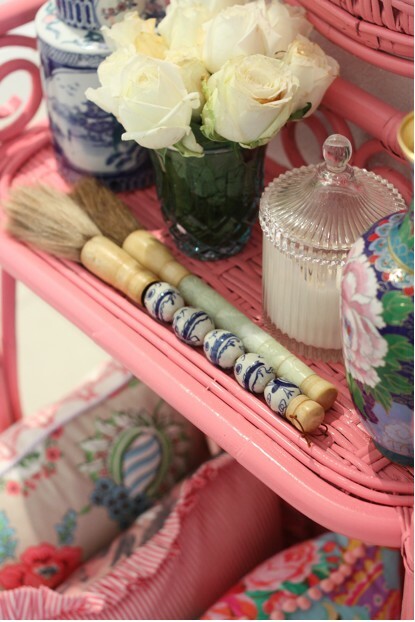 I love your beautiful vintage furniture stand and it looks gorgeous in pink. You must be really happy with it. I love this Kellie! Well done. I feel inspired. Hi kellie, you couldnt have gone wrong with any shade of pink, but I really love that particular colour. I can imagine it must have been a little tricky painting all the intricate parts but it looks just fabulous and all your pieces look great displayed together! - you have been busy! 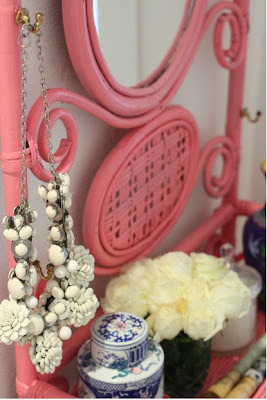 the vintage touch + pink .. I love it! What the perfect color too! So pink and pretty. I love it!!! Fab transformation the perfect pink! like the nice pink color you have used... great ! Beautiful things! I loved all things. this interior looks lovely!~thanks for sharing! 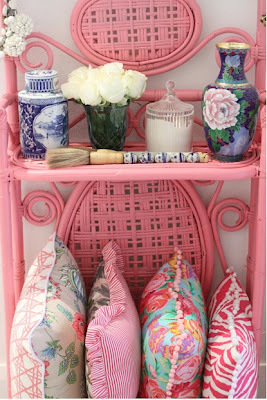 I cannot get over how a coat of pink paint instantly updates this wicker piece into pure amazing-ness! This piece is just stunning!! What a great find! I love the pink with the blue and white accessories! Thank you for the beautiful inspiration! Wow...gorgeous pink! It sure looks nice! Have a great day! What a great little piece! super cute! Fabulous color!! I'm loving it! Looks fantastic Kellie. How did you go about painting it? This looks amazing Kellie! Great idea!